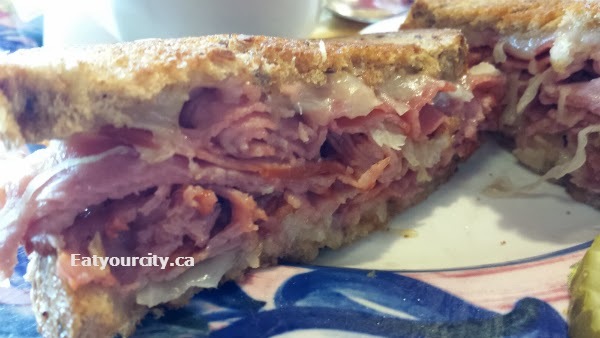 Eat Your City: Glenn's Family Restaurant Gasoline Alley, Red Deer County, AB - Tasty soups, sandwiches and huge selection of tea! 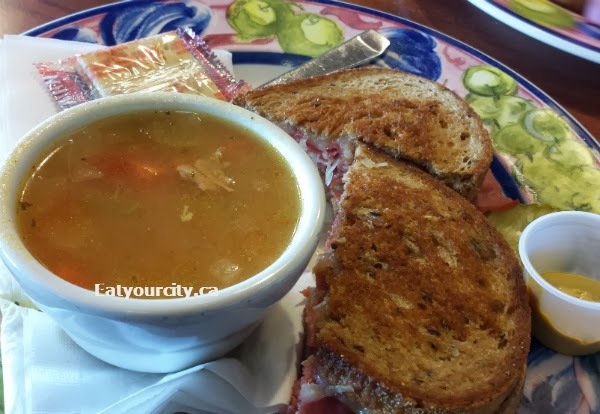 Glenn's Family Restaurant Gasoline Alley, Red Deer County, AB - Tasty soups, sandwiches and huge selection of tea! Posted by With many trips down to Calgary over the years, we usually stop in Gasoline Alley to fuel up both the car as well as ourselves. Its grown over the years to more than just a handful of fast food joints... and Glenn's Family Restaurant is practically an historic venue being around at least 30years ago. With its characteristic teapot right beside the Donut Mill's windmill, its hard to miss and you don't want to miss out on their tasty sandwiches, soups and huge selection of 200+ teas. Service is polite and quick - they know most folks are stopping in for a quick bite and then either head to north up to Edmonton and beyond or down south to Calgary and beyond, but neither do they rush you if it looks like you're happy to sit back, take a breather and enjoy your steaming cuppa tea. Its family friendly and coffee is on the house. I had a delicious cup of Ginger Pieces tea with some honey (no pic, sorry I forgot) which is served in a big teapot... ask for to go cup if you're in a rush as that teapot easily holds 2 large teas in it! 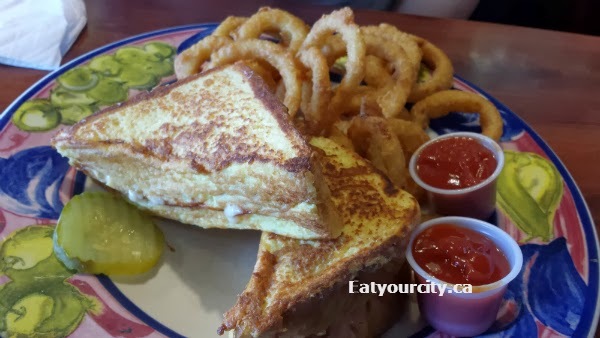 For lunch my boyfriend had the Monte Cristo with a side of crispy onion rings. The Monte Cristo was stuffed with thick slices of roasted turkey breast, ham and Monterey Jack cheese, dripped in egg and grilled. The bread is super fluffy and light with lots of eggy goodness, and though it could have used a touch more cheese, it was a fabulous sandwich. Next time we'll have to try the Blueberry Hill Monte - the same delicious Monte Cristo but topped with cream cheese and blueberries. I had the Reuben with a cup of soup of the day. 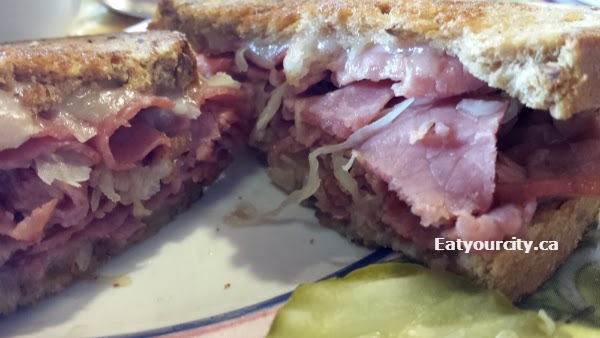 The reuben was packed full of hot sliced corned beef topped with a smattering of sauerkraut (it could have used sooo much more sauerkraut, but I love sauerkraut), melted Monterey Jack cheese on grilled rye bread, served with a side of regular or hot mustard. Its salty, savory mmmmm! 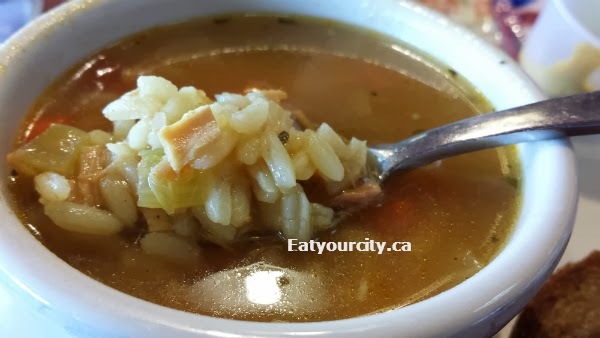 The soup of the day was chicken and rice... it tasted of chicken bouillon, but was loaded up with lots of rice, veges and chicken so not complaining... slurp! 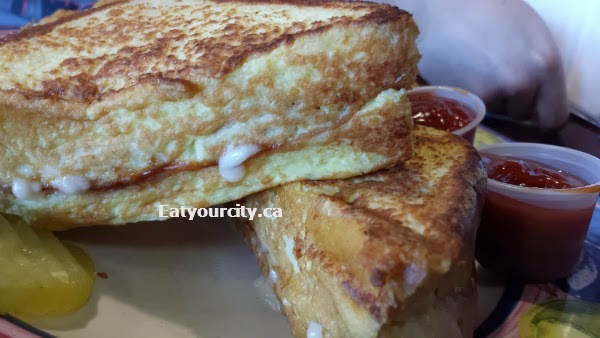 Probably the best and only place to grab a family friendly sit down sandwiches and tea in Gasoline Alley whether you're heading up north or south on QE2. Be sure to check out Cindy's Gifts next door and pick up some tea before you head out.